The Trust warns of the devastating consequences of not taking action to reverse the decline in elephant populations. When a young calf is orphaned, it is often because a poacher has killed its mother for the ivory trade. Occasionally though, a herd must make the difficult decision to abandon a newborn if it is unable to keep up with the herd, or if it has become stuck in mud or a waterhole. Tiny Kamok was found wandering alone, uneasy on her little legs, with no sign of her herd. Back at the Nairobi nursery, it was discovered that this day-old calf had weak joints. Even newborns are expected to travel long distances. Earlier this year, a local community found a three-week-old calf in a well and they alerted the trust. The DSWT’s mobile rescue team airlifted the orphan to the Nairobi Elephant Nursery in Samburu National Reserve, Nairobi National Park, where the trust runs its Orphan’s Project. A calf depends on its mother’s milk for the first two years of life and would die without the trust’s care and expertise. Dame Daphne Sheldrick, who founded the trust in 1977 in honour of her husband, naturalist David Sheldrick, was the first person to raise an elephant orphan that was still dependent on milk. Over many years, Daphne developed orphan husbandry and a milk formula by trial and error until she successfully raised a calf less than a year old using baby formula and coconut milk. With their expertise, dedication and worldwide support, the David Sheldrick Wildlife Trust team has saved over 150 elephants. A team of keepers cares for each elephant orphan until it is fully grown and independent and chooses to live with wild herds. This usually happens by the age of ten. Colourful blankets have become a symbol of the orphanage, but they are much more than a symbol. These soft blankets offer a substitute to young elephant orphans for the comfort and protection that would have been provided by their doting mother. In the wild, vulnerable elephant calves are protected from the wind, rain and heat by standing close to their mother and extended family members. Young calves are prone to pneumonia from the change in temperature between hot days and cold nights. At the nursery, keepers use colourful blankets to keep babies warm at night, and waterproof blankets, soft underneath, to keep the rain off during the day. Blankets are also hung vertically in the orphan’s sleeping quarters or between trees. A blanket not only provides a screen while babies are bottle-fed but replicates their mother’s body as they rest their trunk against it. Elephants are highly social animals and grieve like humans for their lost family. Young elephant orphans are often found clinging to their mother’s corpse. Females are especially impacted by the loss of, or detachment from, their herd because they form strong emotional bonds that last a lifetime. Young bulls tend to leave the matriarch’s herd at puberty to roam with other males, learning from elders how to survive until the time comes to meet female herds for mating. 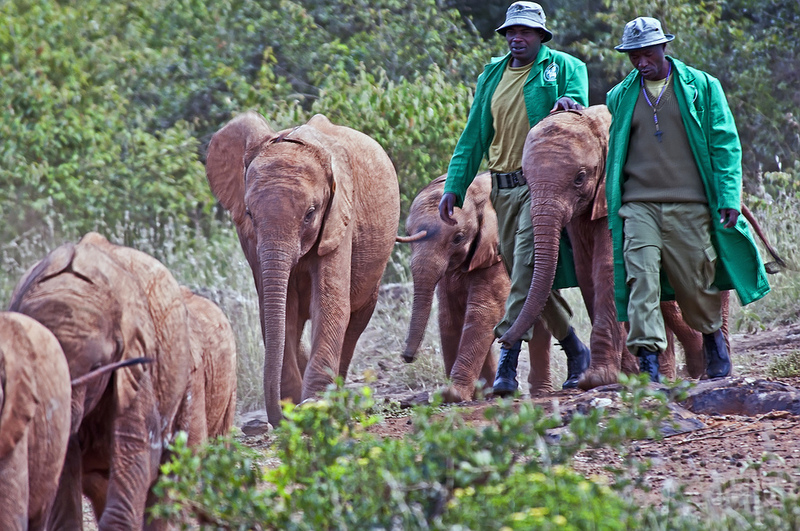 The Sheldrick trust recognises the importance of psychological care alongside physical care to enable elephant orphans to grow into adults that will be accepted by wild herds. Elephant keepers become the orphan’s new family, whether out and about during the day or sleeping alongside their elephant orphans at night. Baby elephants need sincere affection to replace their mother’s care, so elephants are naturally drawn to genuine keepers. Infant elephants respond to kindness, and keepers are able to control bad behaviour simply by words and gestures, so great is the orphan’s trust and eagerness to please a caring keeper. Keepers are rotated among the orphans to prevent them becoming too attached to one person, which can result in life-threatening diarrhoea if keeper and orphan are temporarily separated. The tragic consequences of psychological trauma and resulting diarrhoea were seen when the team was unable to save Losito, the baby elephant rescued when five family members were poached in Tsavo National Park in August. The trust lamented the tiny calf’s death on their Facebook page. 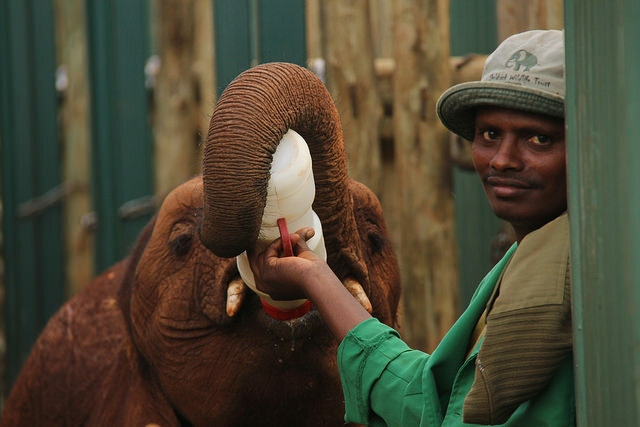 Young elephants are not just orphaned by poachers. Little Wei Wei was only three weeks old when he became a victim of the growing problem of human-elephant conflict. Wei Wei’s herd were chased from a smallholding when they encroached on the land one night. In the morning, villagers found this tiny calf left behind in the confusion. Kenyan Wildlife Services could not locate Wei Wei’s herd, so a DSWT rescue team was sent to airlift him to the orphanage where he will receive the milk formula he needs to survive. KWS asked if the calf could be named Wei Wei after the river close to where he was found. At two years old, young elephants are transferred to the rehabilitation centre at Tsavo East National Park where they join up with elephants they recognise from the Nairobi nursery. Here, elephants enjoy bush walks and mud baths, and they no longer sleep with their keeper in preparation for life back in the wild of the Tsavo Conservation Area. The trust also runs Community Outreach Programs that focus on improving community education and living, wildlife education, and assistance with the prevention of human-elephant conflict. Children from Kenyan schools visit the elephant orphanage where they learn about the trust’s work and the impact of ivory poaching; they may even become the wildlife guardians of the future. With funding from British Airways, the trust has also erected beehive fencing based on Dr Lucy King’s Elephant and Bees project, helping to protect community land near trust headquarters in Tsavo. The beehives recently produced their first batch of elephant-friendly honey. The David Sheldrick Wildlife Trust, the winner of the Just Giving Charity of the Year 2015 award, welcomes visitors from around the world for a short period each day. But if you can’t go in person, Google and Save the Elephants have joined forces to provide a virtual experience of Kenya’s Samburu Park, including the Nairobi Elephant Nursery. 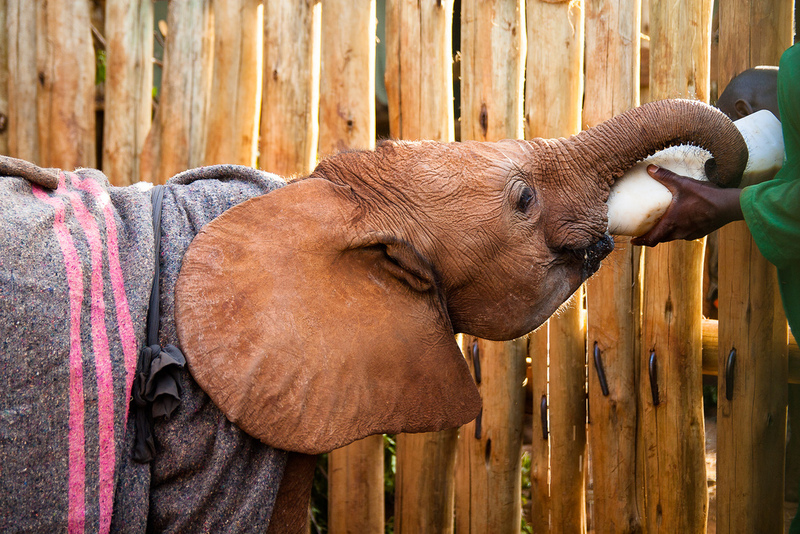 If you would like to support David Sheldrick Wildlife Trust’s inspiring work, their website has more details about their Orphan’s Project as well as stories of rescued orphans you can foster in their foster program. You might also like to read Charles Siebert’s wonderful feature on the David Sheldrick Wildlife Trust published in National Geographic. Image credit: Thank you to the following photographers for their work showing the trust’s care for vulnerable elephant orphans as they prepare them for life back in the wild.